As the Interior Department moves to undermine the West’s landmark sage-grouse conservation plans, a new analysis from the Center for Western Priorities finds that oil and gas companies with ties to Acting Interior Secretary David Bernhardt own a fifth of all federal oil and gas leases in sage-grouse habitat throughout five key Western states. Just four years ago, Interior Secretary Sally Jewell announced landmark plans to conserve the sage-grouse, an imperiled bird whose habitat covers vast swaths of sagebrush across the West. These plans were the result of extensive negotiations between Western governors of both parties, ranchers, industry, and conservationists, and were designed to conserve critical habitat and boost grouse populations — keeping the bird off of the Endangered Species List and providing certainty to industry and local communities. Now, under Acting Secretary David Bernhardt, the Interior Department is expected to finalize changes to sage-grouse conservation plans, stripping key wildlife protections to allow more oil and gas development. On his first day as Deputy Interior Secretary, David Bernhardt met with his boss, then-Secretary Ryan Zinke, who directed him to take charge of re-writing landmark sage-grouse conservation plans. Formalized in a memo three days later, the order placed Bernhardt, a former oil and gas lobbyist, in charge of weakening critical wildlife protections, a move long sought by his former clients. 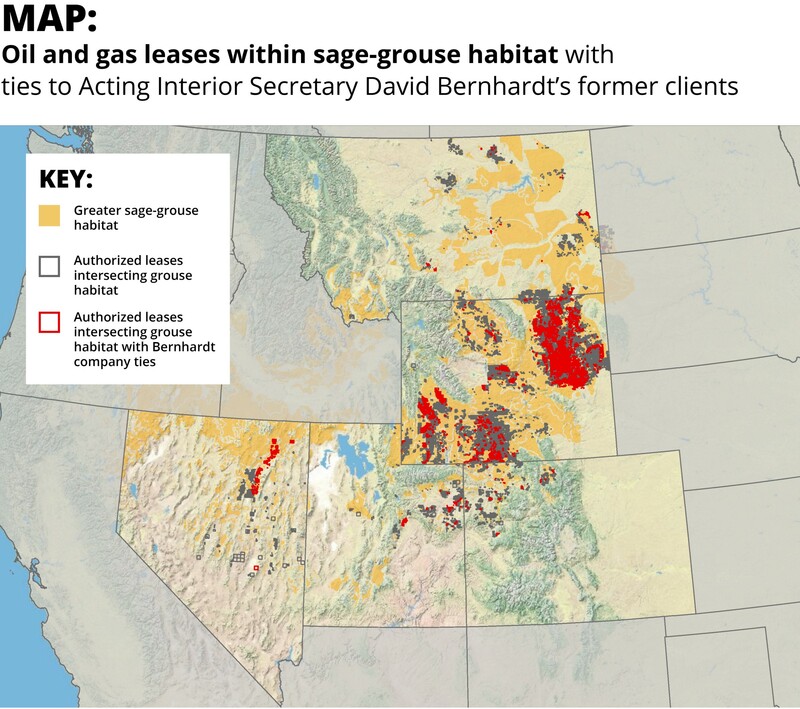 Bernhardt’s former clients, which include major oil and gas corporations and trade associations, have a significant footprint in sage-grouse country. According to new analysis by the Center for Western Priorities, oil and gas companies with ties to Acting Interior Secretary David Bernhardt own 20.4 percent of all federal oil and gas leases that overlap with sage-grouse habitat across five Western states — Colorado, Montana, Nevada, Utah, and Wyoming. Combined, these leases span 2,014,651 acres. The Center for Western Priorities analyzed publicly-available data in the Bureau of Land Management’s LR2000 database, first identifying authorized oil and gas leases Colorado, Montana, Nevada, Utah, and Wyoming, and determining which leases intersected with sage-grouse habitat, as identified by the Bureau of Land Management. 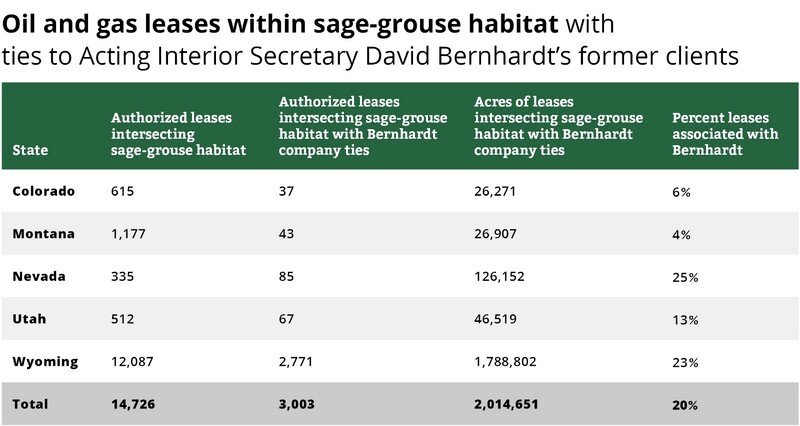 Applicable leases were then filtered by developer to determine which leases were owned by companies, and their subsidiaries, linked to Acting Interior Secretary Bernhardt. These include former clients, as identified by ethics recusals, financial disclosures, and lobbying records, as well as companies that sit on the Board of Directors of the Independent Petroleum Association of America, a major oil and gas trade association that was a Bernhardt client. The resulting data was refined to remove duplicate leases. In December 2018, the Interior Department released draft sage-grouse plans detailing their intent to strip sage-grouse protections and open millions of acres to drilling and mining. The elements of this proposal are expected to remain largely the same as the agency finalizes changes to the plans. 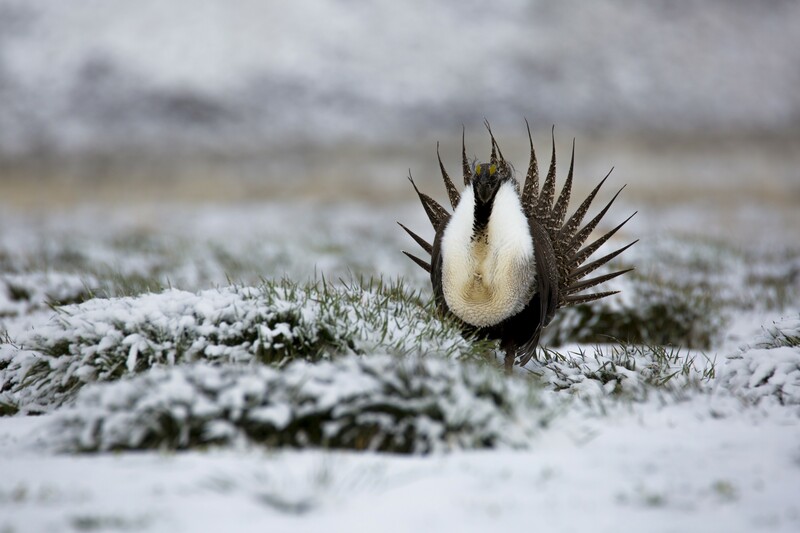 The agency’s draft would eliminate requirements to prioritize drilling outside of critical sage-grouse habitat, trade a landscape scale approach for more state-specific plans, and cut requirements for companies to offset habitat damage with conservation gains elsewhere. The Independent Petroleum Association of America has long served its members as their lobbyist and representative in Washington. Each year since 2008, the group has reported more than $1 million in lobbying expenses to influence legislation and administrative actions. According to financial disclosures, IPAA also recently paid David Bernhardt to perform legal services on the group’s behalf, and Bernhardt pledged to recuse himself from specific matters to which IPAA was a party. During the Trump administration, IPAA has been integrally involved in rewriting sage-grouse conservation plans. Documents obtained by the Western Values Project indicate that IPAA lobbyists secured numerous meetings with key Interior Department officials, providing an entré for specific companies to give input into sage-grouse plans. In one instance, IPAA arranged phone calls for Chesapeake Energy, ConocoPhillips, and EOG Resources to ask BLM for specific revisions to sage-grouse maps. During the process of amending the sage-grouse conservation plans, IPAA submitted formal comments recommending specific policy changes. It appears that certain IPAA recommendations — such as cutting requirements to offset habitat damage from development with conservation gains elsewhere — were accepted by the BLM, either partially or in full, as a part of the agency’s draft plans. During his time at Interior Department, Bernhardt has pushed policies favored by his former clients with alarming speed. Since his swearing in on August 1, 2017, the Interior Department has moved forward with at least 19 policy actions supported or requested by 16 Bernhardt’s former clients. These include multiple policy requests by IPAA — eliminating rules that increase the safety and transparency of fracked wells, overturning regulations that reduce methane leaks from oil and gas wells on public lands, neutering the Migratory Bird Treaty Act, eliminating rules that give taxpayers a fair share of oil, gas, and coal extracted from public lands, and reducing wildlife protections under the Endangered Species Act.